The Nashville Predators centerman has undoubtedly taken that message to heart. Fisher will suit up for the 1,000th game in his NHL career on Thursday night, when the Preds host the New Jersey Devils at Bridgestone Arena, becoming only the 301st player in League history to hit the mark. The journey began in Peterborough, Ontario, and for as long as Fisher can remember, he was on skates. Like many who grew up in Canada, the dream was to one day make it to the NHL, but that was truly all Fisher ever wanted. He certainly had the talent to do so. Drafted in the second round of the 1998 NHL Entry Draft by the Ottawa Senators, Fisher posted 41 goals and 106 points during the 1998-99 season with the Sudbury Wolves of the OHL, his second campaign with the club. Those numbers, combined with a strong training camp, earned the then-19-year-old Fisher a spot on Ottawa’s opening night roster to begin the 1999 NHL season. He has never played a game in the minor leagues. Fisher played 10-plus seasons in Ottawa, including a run to the Stanley Cup Final in 2007, establishing himself as one of the hardest-working, two-way centers in the League. Fisher tallied what was at the time a career-high 48 points during the 2006-07 season, helping to guide his team to a chance at the ultimate prize. The Senators came up short, but Fisher’s experience in the Final has stuck with him. Life began to change in the Canadian capital in the years to come, on and off the ice. In July of 2010, Fisher married country music star Carrie Underwood, but with Fisher still playing in Ottawa and Underwood residing in Nashville, the relationship was long distance… Until a few phone calls changed things. Fisher was dealt to the Predators for a pair of draft picks on Feb. 12, 2011, a bittersweet day. The emotions of leaving the only NHL franchise he had ever known were palpable, but the excitement of not only joining a team contending for the postseason, combined with the realization that the couple would be together in the same city, provided a feeling of contentment. 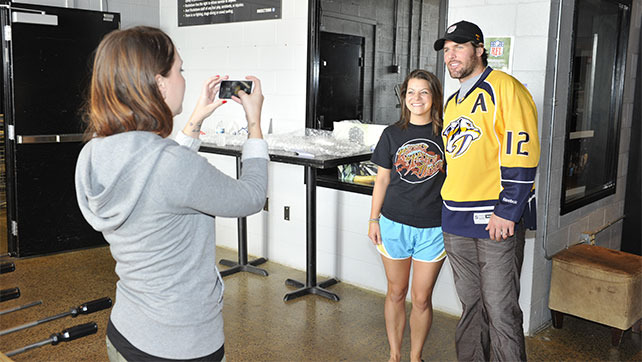 Fisher enjoyed a career year in his first full season with the Preds in 2011-12, scoring 24 goals and 51 points, before helping the club to reach the second round of the Stanley Cup Playoffs. Named a full-time alternate captain to begin the 2012-13 season, Fisher’s leadership on and off the ice is one of his most admired qualities. Fisher was the recipient of the 2012 NHL Foundation Award, which recognizes a player who applies the core values of hockey – commitment, perseverance and teamwork – to enrich the lives of people in his community. Fisher works with Room In The Inn, Cottage Cove Urban Ministries and Rocketown, all Nashville organizations who are dedicated to bettering the lives of those who call Music City home. Fisher inked a new two-year deal with the Predators last summer, locking him up through the 2016-17 season. At the time, General Manager David Poile expressed his belief and willingness to keep Fisher with the club for as long as the center would like. “Any time your GM says something like that, it’s a great feeling,” Fisher said. “I’m definitely proud to be here and be a part of the group. Things have worked out well for the kid from Peterborough who didn’t want to do anything but play hockey. But he’s also done so much more. Nashville is home now, and although Fisher knows he won’t be able to play forever, he’s enjoying every moment he has left. He’s done it 999 times. A few more outings would be just fine.